Back in the snail mail days, it was quite normal to have a selection of pen pals; fellow letter-writers you might never meet, but with whom you exchanged a correspondence. The aim was not to supplant local relationships, but to enrich each other’s lives from afar. These friendships on paper, born out of combinations of curiosity, shared interest, sympathy and desire, satisfied our love of storytelling, adventure and sharing. Through them we may have practised a foreign language and/or found out about a part of the world or an approach to life far from our own, inter-changeably spilling our guts or helping the other through a tough time. In many ways these analogue exchanges were so different to the high-speed backwards and forwards of emails, but to me, the relationships and the motivation is not dissimilar to the wonderful world we knitters have built online. 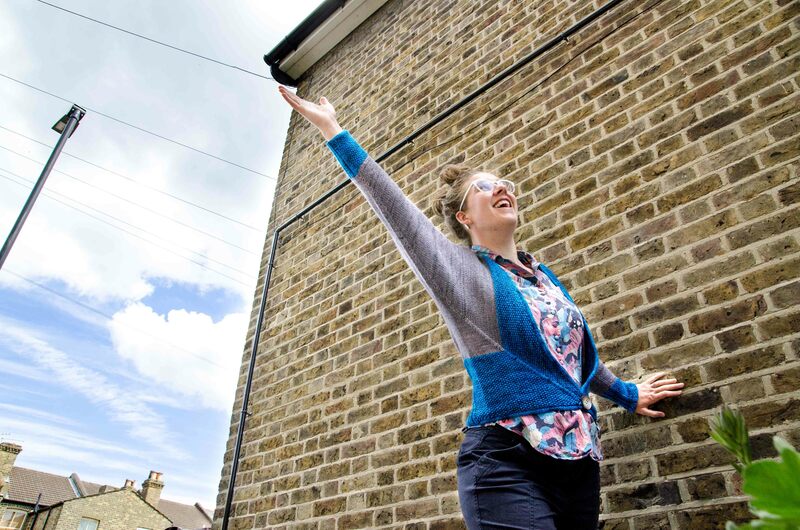 We might never actually get to knit together on the same sofa, but we sure can provide life support through offering everything from encouragement, advice and jokes to parcels of yarn. 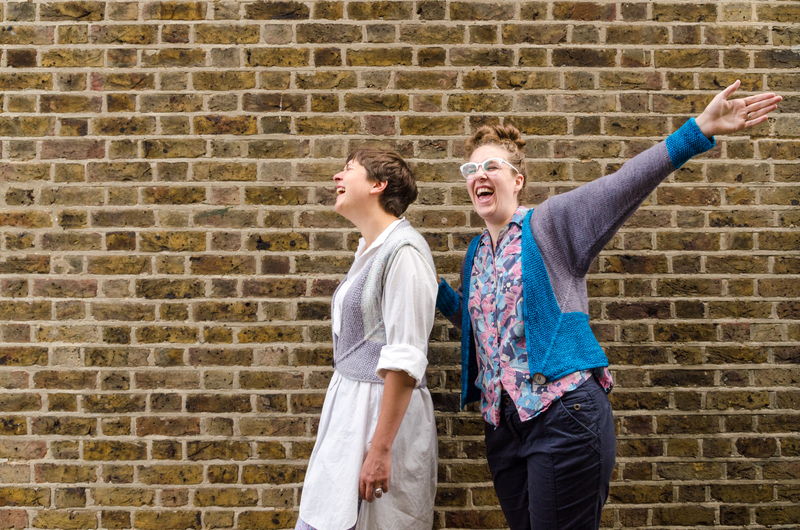 The tenuous links of the digital realm are frequently poo-poo’d, yet these are real friendships firmly based in the hands-on reality of our knitting and the human propensity for love and generosity. When the likes of Skype were still part of a science fiction future, international phone calls were reserved for speedy, once-a-month calls to my grandparents, letters and postcards were the only way to go. On top of the far away friends I had a chance to roam around and play with (and then exchange highly stickered letters on novelty paper) and local friends who got postcards when I was off on holiday, I also had correspondences with fellow girls who I never met. People like Maria in Greece who Priscilla (my English grandmother, who was neither English or blood-related) had met while on holiday and decided an exchange should occur. And then there were the arrangements made by my secondary school French language class. The legacy of all these correspondence is that I can sometimes still identify someone’s country of origin based on the style of their handwriting. I also think those letters, to mysterious pen pals and known friends alike, are the foundations of the writing I do today (much more so than the essays and reports I weaselled out of doing during my years at school). But what’s all this got to do with a knitted garment? Well, Pen Pal the waistcoat/cardigan started its existence as the result of a long-distance correspondence between Hannah, who dyes the beautiful colours of Circus Tonic Handmade yarns in Sydney, Australia, and myself in London, England. This was an online correspondence until one day an unexpected parcel arrived from a mysterious corner of my city. It turned out Hannah’s mum had been enlisted to mule yarn between us while she over on holiday. I started to imagine a garment that could grow out of these few skeins: one that might work in the warmer Sydney climate where Hannah and her crew are based, but also make sense for my home in London, which gets significantly colder. 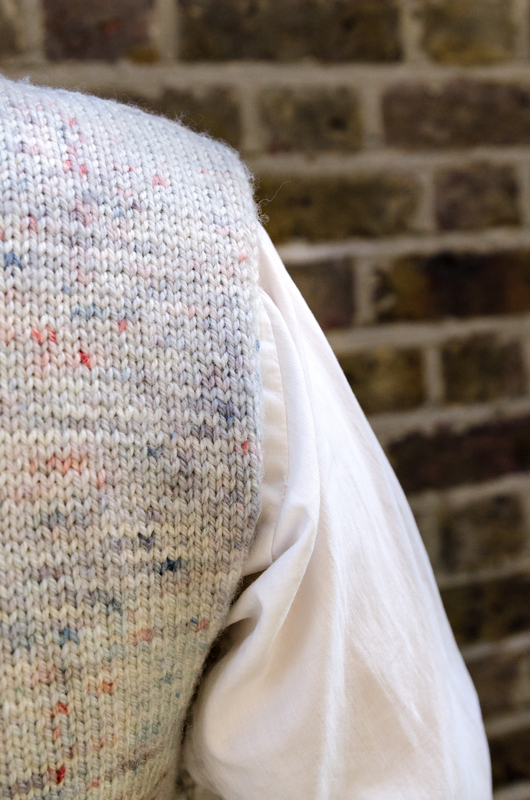 There was a simple, hand knitted waistcoat that I rescued from a charity shop a couple of years before that I really enjoyed wearing and got my design brain ticking over. I wanted to see if I could do something that would fulfil a similar role in my wardrobe, but made and designed by me: a way to add a little bit of warmth and colourful character to outfits or the potential to be an additional body-hugging layer under a cardigan. I wanted to design it in one piece, to avoid knitting it in 3 pieces, knowing this would add more adventurous construction and a challenge. It would then allow me to use a couple of colours of Hannah’s handdyed in a more unusual way than stripes or blocked pieces. (I knew I didn’t want to use DK for colourwork for a pattern I hope will work in the Australian climate too.) It was also purely practical – I could make use of the 3 skeins of DK Hannah had sent before either of us knew what they would become. And 3 skeins is what we often use for shawls, so it was about creating an alternative to adding yet another shawl to the collection. Pen Pal became a fun puzzle to knit and then communicate in pattern form: the body is formed by a mitre on each front, which leaves only two short seams to sew up to the shoulder. 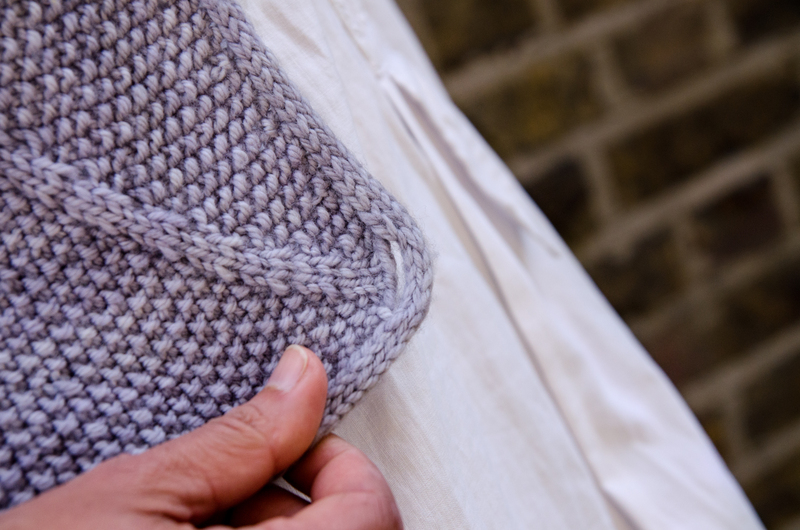 Short rows create a deep plunging V, ideal for wearing open, or the single big button can bring together the mitre fronts like a sticker on the back of an envelope (the colourful kind, with a bright sticker or sealing wax to keep it firmly closed – the kind you might get a nice letter in, not a bank statement). I’m thinking it’s perfect for between seasons in London and Sydney winters. It’s also a great thing to throw on in the air-conditioned spaces many frequent. The sleeves, if you chose to add them, are picked up at the shoulders and knitted down in the round, to the cuffs. The line of increases that create the mitre on the fronts continues in a line down the sleeves made up of decreases. It means the sleeve shaping isn’t exactly under the centre of the arm. That continuous line is a design feature that I love. It makes hailing a bus or reaching for things high on a shelf an even better plan. It extends super satisfyingly into the cuff too. The cuff, in its final form, came about while having a conversation at Wild & Woolly (where you can find some of Helen’s yarn) about how to finish it off. My first thought had been to do it in moss stitch, but then it was pointed out by Helen (I think), that it had to be in moss stitch AND rib to perfectly mirror the body, which is of course true! The i-cord cast-off was also a solution we cooked up in that conversation. 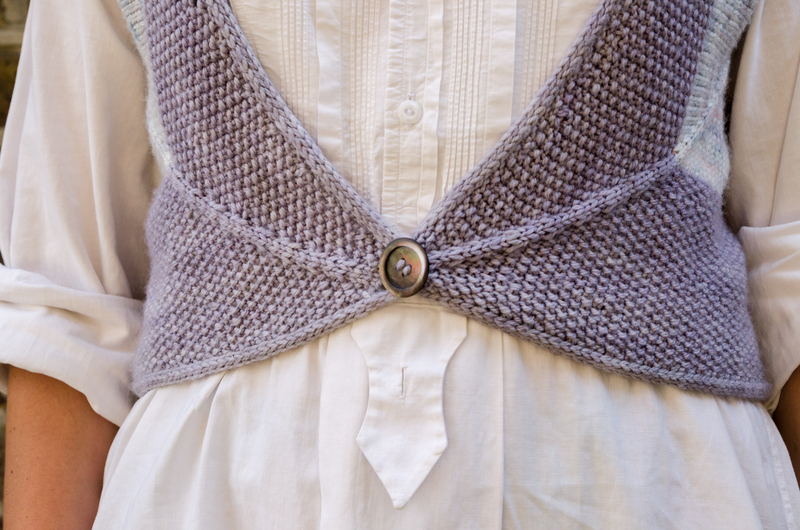 The waistcoat can be conveniently worked on a single size/set of long circular needles. If you are a magic looper, you can use the that same set for the sleeves and cuffs too. If not, you might want to add a set of DPNs and maybe a 40cm circular for the shoulders down. The variety in the stitch patterning between stocking stitch, moss stitch and ribbing adds interest while you knit, but with practical reasoning behind it: ribbing at the back gives a nice cinched-in effect at the waist, and the moss stitch creates beautiful texture and structured flatness. And the i-cord cast-off just finishes it all off so satisfyingly, with the buttonhole almost hidden in it; a detail that just fills me with joy. While not dyed on the same base – The Wool Kitchen, DK yarn is spun from Blue Face Leicester and Circus Tonic Handmade’s Carousel DK comes from Merino – both have the exact same weight to length ratio. It’s worth noting that they knit up a little differently. Personally I changed my needle size between the samples I made in each (I address this in a note in the pattern, where I also suggest needle size). It’s like the Merino is a little plumper, while the BFL has a little more drape. Why work with two dyers on one pattern? 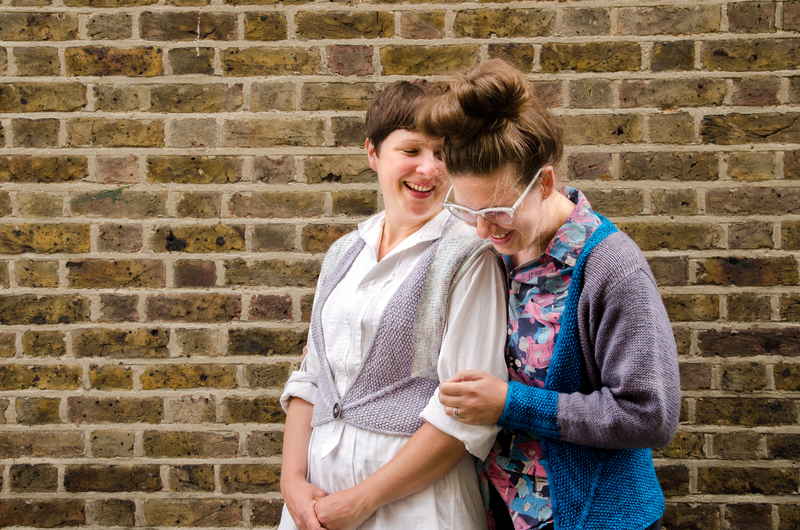 Well, I love both Helen and Hannah and their very different, yet synchronious, approaches to yarn dyeing. 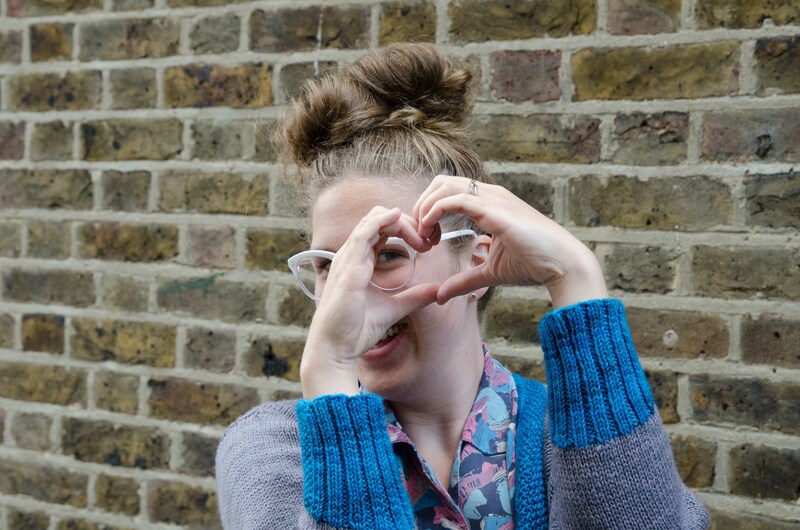 It’s a way of spread the love and the work involved around a bit (and give more local yarn options to those who will knit it, depending on which hemisphere you are in). As a designer, I don’t have it in me to design for every yarn that inspires me (that’s the realistic timing of handmade things and me being a bit of a slow poke). These things take time and mostly justified by the satisfaction and connection, rather than significant financial gain. Collaborating with good people is part of what keeps this interesting for me. Learning about each other through what we do well is endlessly satisfying. Not that everything is satisfying and/or easy. Sometimes there are bits that just need to be done, like being in pictures. It’s not something that would be on my oh-yes-please-I’d-like-to-do-that-every-day list, but I think it’s important that you see us as makers in the pictures. Being in pictures does get a little easier the more I do it and is way easier when working with fun, patient and smart photographers who make you feel comfortable and confident. 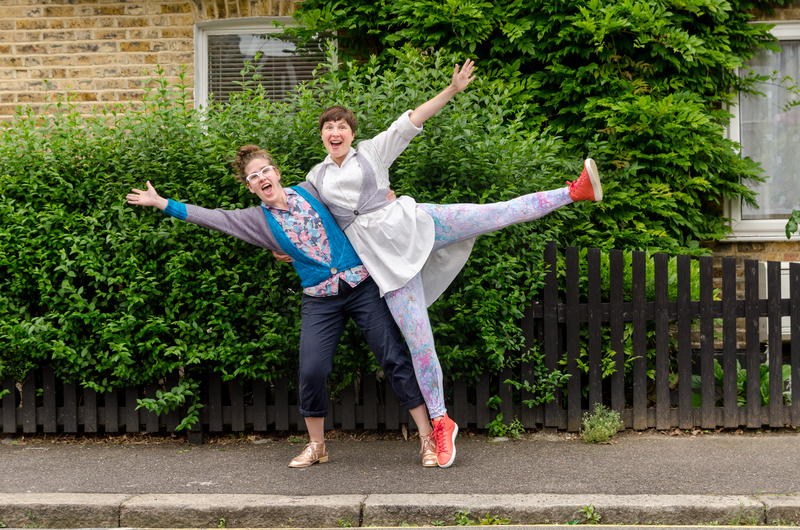 You can see Helen and I in the photographs, taken by Jeni Reid in Walthamstow, while she was visiting from Friockheim. Jeni has an equally collaboratorial approach to everything she does, so it is fun to have her as part of the Pen Pal gang. There’s an invisible Amelia Hodsdon working her magic in the background, with tech-editing and directing the day of shooting. Anna Feldman was also there as moral support. And as always, Kristin Blom in Uppsala was immensely skilled and patient laying the pattern out just-so, through the many many hours of backwards and forwards tweaking that it took. This time she drew the schematic too, to not just to show where on the garment the measurements refer to, but also to help illustrate the fiddly to communicate construction. I just wish we could have been there altogether for the photoshoot, all wearing Pen Pals. Maybe one day! In the meantime, we have our correspondence and now the experience of Pen Pal-ing together! For me, working on a pattern together is about supporting each other; extending our reach beyond what we can do as individuals (especially on creative person’s budgets) – sharing the work of making a pattern happen and getting it and the yarn out into other knitters’ hands. I certainly can’t make a pattern by myself and I do a good amount of designing (and designing isn’t even the half the work of encouraging people that a pattern is knitworthy). It takes a lot of people to put together a good pattern. 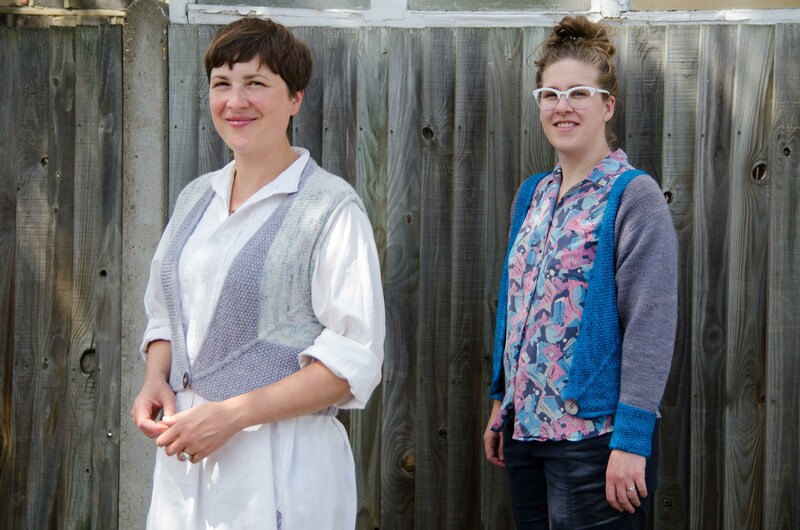 Both Helen and Hannah gave me wonderful feedback on the pattern instructions: how to improve the pattern for the people who would knit it in the future became part of our correspondence with each other. And the garments they test-knitted become the samples they will each be able to use to show off their dyeing work and help suggest what can be made with it, pointing knitters to my pattern. I hope you’ll take the time to familiarise yourselves (if you aren’t already) with their amazing approaches to colours and communicating their love of what they do. 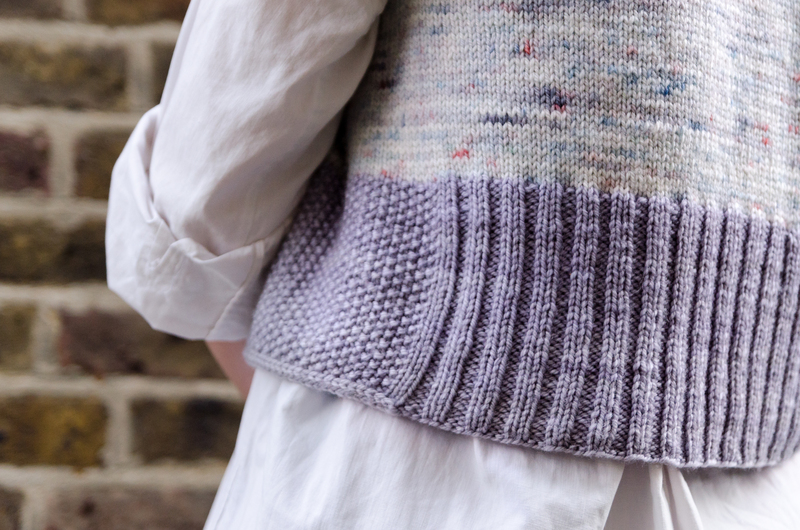 There have been so many places that Helen, Hannah, Jeni, Kristin, Amelia and I have exchanged knowledge and helped each other along the way in preparing for the sharing of this pattern (and all sorts else), but finally it’s ready for your needles. I must say, it makes me very happy to think that this pattern might become part of other correspondence too, online and off, as it is cast on by you – perhaps as a Pen Pal KAL with your knitting pen pal? You can purchase the pattern here, via Ravelry. You can purchase Hannah’s yarn here, via Etsy. You can purchase Helen’s yarn here, via Etsy. What a lovely story. I have a penfriend in Norway and started writing. when I was 12, We are both 60. We have visited each other several times and on one occasion I knit a fairisle top which involved a technique which I now know as steeking as she did it for me in Norway.